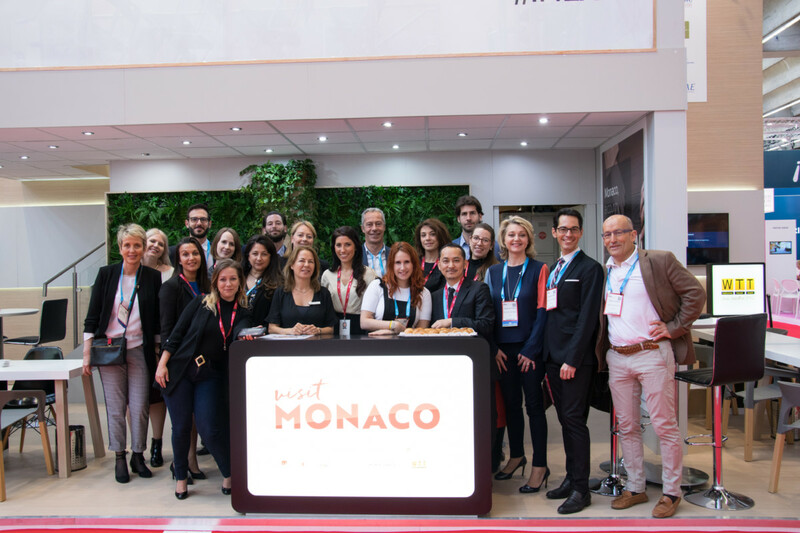 This year’s IMEX Frankfurt ended on a positive note for the Monaco Convention Bureau, where both the quality and the high number of qualified buyers exceeded exhibitors’ expectations. Nine partners joined the Monaco Convention Bureau this year as well as the local representatives from the UK and DACH. Various activities were on offer to enjoy between the meetings. The mixologist from the Columbus Monte-Carlo Hotel served refreshing cocktails and a therapist from the Thermes Marins Monte-Carlo offered hand massage for visitors. And that’s not all, the Executive Chef Philippe Joannès from The Fairmont Monte-Carlo Hotel was also on site to prepare delicious canapes and give the guests a little taste what it’s like to host an event in Monaco. Stand partners who joined this year included the hotels Columbus Monte-Carlo, Fairmont Monte-Carlo and the Monte-Carlo SBM Group. The following DMCs: DreamCatcher, Incentive Concept, Lafayette Monaco, Raising Stones Events and Welcome Travel Team / Publi Créations. Last but not least the congress centre Grimaldi Forum Monaco was also at the show. Monaco Convention Bureau hosted a press conference to give international journalists an update about the destination. In 2017 Monaco saw a positive 5.6 percent increase in room nights, making an overall MICE market share of a record 26.1 percent, an increase from 18 percent from 2012. This increase comes as a result of the dedicated efforts to increase the MICE business over the winter months, which the Convention Bureau has been strategically working on. Hotels also have demonstrated a positive performance with 65,40 percent occupancy rate across the 3 – 5* segment hotels. This is a 1,4 percent increase from a previous period. The Monaco Convention Bureau launched a campaign back in 2013 with the aim to change destination’s perception to be more appealing for international MICE. While playing on the clichés, they kept the DNA of the destination they are famous for and proud of. They chose to highlight the values and the USP of their destination with the arguments of legitimacy for hosting events. Thanks to this campaign, they improved their international competitiveness for corporate and association MICE. Additionally, as the previous figures show, they were able to fill the quieter winter months with business travellers. The initial campaign targeted three key sectors: finance, medical and technology. As the campaign progressed so the focus shifted to promoting values over sectors. These include: good value for money, excellent service and strong expertise hosting business events. This year, the new add-on to the campaign focuses on the medical congresses. This comes as a result of the constant increase of regulations from government bodies within Europe and industry regulators calling for stricter codes and guideline between pharma­ceuticals, medical-device industries and healthcare professionals. As a result, the Government of Monaco, working together with local stakeholders within the local MICE sector took an action to meet the needs of the medical sector and its regulators in the most transparent way. The medical sector is home to 530 healthcare professionals in Monaco ranging from cardiology and gynecology to emergency medicine and medical biology. With already strong track record in medical congresses, now it will be strengthened with the support to the medical compliance process to respect all the latest regulations that come into effect. For example: from 15 June and 15 September this period is not compliant for a medical congress. The destination also tries to be attentive to the medical field of the congress. Therefore, there should be a link between the speciality of the congress and the destination they are choosing. For more information about how Monaco Convention Bureau can support customers within the healthcare cluster and follow the compliance process you can view the brochure here. Another area of expertise and development is in sustainability and renewable energies. In this sector, Monaco has the infrastructure to host car launch events for electric and hybrid models. Not only its tradition with the motor sport but most importantly the well–developed facilities and infrastructure. The charge points for electric vehicles, for example, make it the destination of choice for car launch events. A recent example is Volkswagen and the launch of their small “up! GTI” model in Monaco. A new area to watch is the Formula-E. With less noise and pollution, that might be the future of Formula 1 as we know it. The local entrepreneur who is the driving force behind this project is Gildo Pastor, CEO and owner of Venturi Automobiles whose goal is to be the best company in the world for Formula-E. This initiative is also supported by the Prince of Monaco, and companies including Toyota and Mercedes use Monaco to develop their concept cars. Monaco Convention Bureau has announced the opening of new incubator and accelerator for start-ups, the Monacotech. Opened last November, it attracted 170 applications and has chosen the first cohort of 20 start-ups. The businesses are in the areas of fin-tech, health-tech, clean-tech, yachting, tourism and leisure, safety and communication. Future aim is to have 30–40 businesses on-site and support them with transitioning into their own premises. Young businesses and entrepreneurs in the early stage can get full support to grow in a modern and supportive environment and benefit from the strong local network, often in non-competing industries. With the current strength of Monaco in health, finance and sustainable development, this incubator will help to breach out also to other sectors while at the same time supporting the existent sectors and broadening the economic diversity. Innovation, technology and digital transformation are important topics in today’s connected world. This November a new conference initiated by the entrepreneur Denis Jacquet will see its debut in Monaco, called Day One. The conference will take place from 28 – 30 November at the Grimaldi Forum and will bring together prominent business leaders. Corporations, start-ups, NGOs, politicians and academics will debate and address the way technologies will impact our future. The programme will focus on the responsibility and leadership that businesses have to exercise in order to create a fair and inclusive digital age, acknowledging that they have the capacity to lead and drive this movement. Monaco is small, but dynamic and ambitious to grow its MICE business. Therefore, an important area of development is its events infrastructure. The two latest and biggest projects are the opening of the One Monte Carlo by SBM Group and renovation and reopening of the Columbus Monte-Carlo Hotel. Currently, the SBM Group is finalising the rebuilding of the Hôtel de Paris Monte-Carlo, with completion due end of December and building a new venue, the One Monte Carlo. The modern urban building will have shops, art galleries, restaurants and cafes as well as meeting spaces. Upon its completion, the Hôtel de Paris Monte-Carlo, Hôtel Hermitage Monte-Carlo and One Monte Carlo will be part of a new business district to be able to welcome bigger groups up to 700 people. Completion is scheduled for end of 2018 with being able to welcome groups in the beginning of 2019. If you’ve stayed at the Columbus Monte-Carlo Hotel, as I did in 2014, you won’t recognise the property anymore since its latest renovation. It’s brand new after the over 15 mio Euro investment. They’ve redone the entire concept to reposition the hotel to a boutique and lifestyle hotel. This includes the renovation of 181 rooms, addition of a new Mediterranean restaurant and a bar. Monaco has been very successful in attracting top incentives and congresses and providing good value for money. The updates announced this year at IMEX give event professionals now more opportunities and fresh ideas when pitching this destination to their clients as well as an opportunity to demonstrate how hosting an event in Monaco can help corporate clients and associations achieve their business objectives. Great article and lovely to have met you at IMEX, please let me know if you are ever in the Monaco area & free for a coffee to discuss work related opportunities.